I first met Bob O’Hara ’63 in November 2011 when I stopped by his 102-year-old home to thank him for his support and dedication to Saint John’s University. Bob is a generous Fellows Society donor and has Saint John’s in his estate plan. He has been a class volunteer, participated in campus retreats and attended many alumni events. Bob was born in Osakis before moving to the Twin Cities, and his family would stop at Saint John’s on the way to visit his grandmother. Walking around the campus and enjoying the beauty of the surrounding woods helped cultivate his lifelong love of nature. When it came time to apply for college, Saint John’s was the only school Bob applied to. He earned a degree in biology and went on to teach and coach in the Twin Cities for 37 years. Teaching allowed Bob to pursue his passion for the outdoors. For nearly 60 years, he has been doing canoe trips up north – WAY north. Canadian Arctic north. His trips usually last 35-45 days and typically include groups of 4-6 people. Areas he explores can be so isolated there is no way to communicate with the outside world. Travelers need to be very careful – if something goes wrong, you can be in a great deal of trouble. 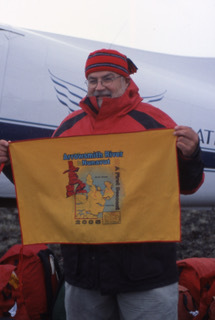 One of his early trips was to the Arrowhead River in Nunavut, Canada, which is over 1,500 miles north of Minneapolis. His group was the first recorded non-native people to descend the Arrowhead. They traveled from Minneapolis to Baker Lake, Nunavut, a hamlet just south of the Arctic Circle. Baker Lake is not accessible by road, so they flew in on a single-engine de Havilland Canada DHC-3 Otter that could land on the tundra. This trip required the use of Pakboats — folding “boats in a bag,” since no canoe could fit in the plane or be tied outside. It was Bob’s first experience with these new canoes, which have sturdy metal frames and soft sides. They added covers to keep gear dry. Since the river had never been paddled, they had many interesting experiences with ledges, waterfalls and sandy areas. They carried all their supplies, including camping and first-aid gear, food and other necessities. They ended this trip on the Arctic Ocean and had to paddle an ocean bay for 20 more miles to get to Pelly Bay, an isolated Inuit settlement now known as the hamlet of Kugaaruk. Bob said the fishing was great, with ample supplies of lake trout and grayling. While on the trip they saw wolves, caribou and evidence of bears. Upon completion of some trips, Bob would leave his canoes in the area to prepare for a trip the following year. At one point he had 12 canoes in Canada waiting for future trips. Bob was elected to the Explorers Club of New York in 1978, and last year he was the featured speaker for the Superior Hiking Trail Association. He speaks annually at the Midwest Meeting Spring Expo, and organizes the Far North symposium for the Minnesota Canoe Association. If you ever have the good fortune of meeting Bob, get ready for some great stories of his adventures in the Canadian Arctic. I bet you’ll hear some from Saint John’s as well. you can support Saint John's University. Sign up to have Advancing Saint John's delivered to you. Thank you! Please check your inbox for a confirmation email from Advancing Saint John's. Please also add us to your address book. The newest post will be delivered to you by email. Thank you for your interest in the people of Saint John's University. We hope you will enjoy their stories.